Niko Schwarz's science and programming: How fast is Comanche? The other day I came across this guy who wants to serve webpages in less than a millisecond. Without parallelization. So, his web page is really simple, it looks like this: <h1>Hello TWUG!</h1>. Anyway, I find interesting to mention that Comanche is not far from Apache. 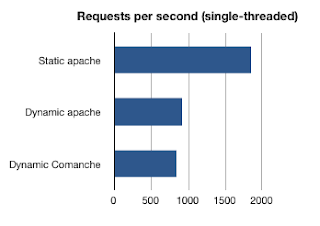 Comanche can serve the same page dynamically (the name is a GET parameter) in 1.1 ms, for which Apache takes statically 0.5 ms. As for Apache-php vs. Comanche, I'd call it a tie. By this way, as the above snippet suggests, a standard Seaside installation for Squeak is quite able to make RESTful applications. Just avoid the Seaside framework and plug right into the Comanche web server. s:=(HttpService on: 8080 named: 'Example Http Service'). John Fremlin wrote me that I should test against lighthttpd. 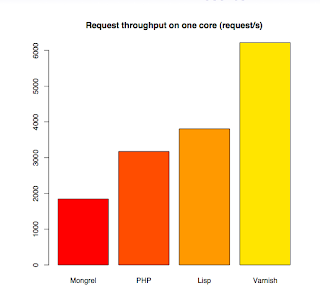 Nico, would you make the same benchmark comparing Commanche with Swazoo as well?